Why England Lose & Other Curious Football Phenomena Explained – including “The Strange Death of the FA Cup”? – including “The Strange Death of the FA Cup”? Professor Stefan Szymanski is one the world’s leading sports’ economists. Highly published in academic journals he has also translated this body of knowledge on the economics of sport for publications aimed at the wider public. His latest book Why England Lose & Other Curious Football Phenomena Explained (co-authored with Simon Kuper, journalist and columnist with the Financial Times, and the author of the critically acclaimed Football Against the Enemy) presents a provocative analysis of much of the received wisdom in contemporary football analysis and culture, putting it to the test using quantitative economic and statistical analysis. In this presentation Stefan focuses on a key phenomenon addressed in the book; the decline in popularity of the FA Cup, most recently manifested a by a crowd of less than 6,000 for the January 2010 3rd round FA Cup tie between Premier League clubs Wigan Athletic and Hull City. He explains how for the 1970s, an examination of attendance figures illustrates that games between the same two teams in the FA Cup attracted a higher crowd than when the teams met in league competition in the same season. However, from the 1994/95 season the gap in superior attendances at FA Cup games began to erode quickly until in 1997/98 they fell below the figure for equivalent league games for the first time. Stefan argues that a key reason for the decline in popularity of the FA Cup was that it lacked the heavy, live TV exposure of the Premier League and the UEFA Champions League which were aggressively and successfully promoted by BSkyB. In the pre-pay-per-view TV era before 1992 it had been the FA Cup, rather than the 1st Division, that received the most TV coverage. Much of the magic of the FA Cup came from its semi-exclusive live coverage on terrestrial TV. The decline in attractiveness has been further exaggerated by the fact that “giant-killing”, (defeat of the top division Premier League clubs by lower leagues), a key source of the magic of the FA Cup in terms of its public popularity, now occurs much less frequently since the establishment of the Premier League. This is because whilst in the 1970s first division clubs spent four times as much on players as fourth division clubs, by the late 1990s they were spending more than twelve times as much. With this increased disparity in labour market spending power the probability of likely upsets was dramatically reduced. Stefan notes that since the year 2000 overall attendances at FA Cup have risen modestly every season, but still “the tradition is not what it used to be”. Critically he underpins this analysis with reference to statistical data, and places the analysis of this data within an appropriate discussion of the historical development of the FA Cup and the competitors (Premier League and Champions League) for its supporters, thus elevating any discussion of how the competition might be revived above the level of nostalgic discourse and football cliché. Kuper, S. & Szymanski, S. (2009). 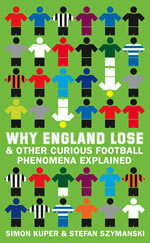 Why England Lose & Other Curious Football Phenomena Explained. London: HarperCollinsPublishers. Stefan Szymanski is Professor of Economics at Cass Business School, City University, London. He is recognised as one the world’s leading and most influential sports economists He has published widely in the academic press on issues relating to the incentives in contests, competitive balance in sports leagues, the business strategy of football and other sports, the sale of broadcast rights, the role of competition law, public subsidies major sporting events, well-being and sports policy, and the economic history of sport. He has advised governments, sport governing bodies and clubs on various economic issues. He has written in the media on business issues relating to football, cricket and the Olympics among others. In addition to Why England Lose & Other Curious Football Phenomena Explained (with Simon Kuper), he has recently co-authored Fans of the World Unite! A (Capitalist) Manifesto for Sports Consumers (with Steve Ross, Stanford University Press), and authored Playbooks and Checkbooks: An Introduction to the Economics of Modern Sports.